D.C. drivers hurt by tough interpretation of Va. offenses is the title of an article in Today's Post about motorists who are ticketed for going over 80 mph in VA who then have their licenses revoked in the District. Sounds fair to me, and yet these motorists who drive recklessly and get caught end up with a story in the Post that is sympathetic to their plight. I guess I'm just really tired of hearing about so called scofflaw cyclists whenever bicycling is mentioned in the press, and yet most motorists break the law every time they drive by speeding (try going the speed limit the next time you drive and see how many cars pass; my guess is most of them), turning right on red without stopping, and rolling through stop signs. Fairfax spends thousands of dollars to "reduce the negative effects of motor vehicle use." The program is called traffic calming, but I think a more appropriate term is the Scofflaw Motorist program. One of the motorists caught speeding over 80mph who now can't drive for 6 months says that he's getting around by bike. He's finding out the hard way that it is possible to live without a car. 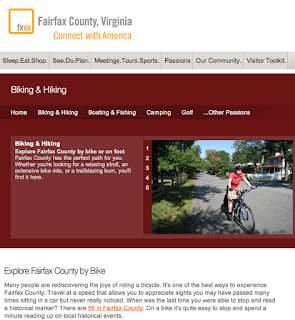 Last year FABB met with staff at Visit Fairfax, a group that promotes tourism in Fairfax County, to request that information about bicycling be included in their outreach materials. The Visit Fairfax website, www.fxva.com, is used by visitors to the county to find out about upcoming events and attractions. Visitors can also obtain information about lodging, restaurants, and shops. Now biking information is included on the site on the Biking and Hiking page. There is a link to the county bicycle route map, places to rent bikes, and a link to the FABB website that contains a cornucopia of bicycle information on the Cyclist Resources page. Thanks Visit Fairfax! Let's hope that more visitors to the county will consider using a bicycle to get around. I also hope that one day we'll have a bicycle sharing system in our urban centers. We've also asked that bicycling information be included in the next edition of the Official Visitors Guide to Fairfax County. We attended a meeting last night on W&OD Trail safety, organized by the Vienna Bicycle Advisory Committee. Several safety measures were proposed that included widening the trail, posting a recommended speed limit for cyclists when pedestrians are present, using thermoplastic rumble strips similar to those used on other sections of the trail, and caution signs warning of congested areas. In attendance were Karl Mohle, Trail manager, Town Councilmember Laurie Cole, Parks and Recreation Director Cathy Salgado, and Vienna Bicycle Advisory Committee members Cris Janoski, Bob McCahill, Sean McCall, and David Schultz. The meeting was prompted by concerns expressed by the Town Council regarding safety on the Trail. See the ABC 7 article Washington and Old Dominion trail to become subject of new campaign. According to Karl, NVRPA does not keep statistics on trail crashes or other safety incidents nor do they regularly receive reports from police when there is a crash. Trail Patrol members often report incidents that they encounter. There are 50-75 active Trail Patrol members, some of whom ride the full length of the trail on a regular basis. Vienna police keep stats on Trail crashes but no police reps were in attendance at the meeting to discuss the topic. The Trail in Vienna is relatively narrow in several sections where there are often more users than in many other sections of the Trail. The parallel gravel trail, which along most of the trail west of Vienna provides an option for some runners and walkers, ends just west of the Town. Widening the trail where possible is one of the better options. Using common sense is probably the best option. We've seen far too many pedestrians wandering across the trail oblivious to oncoming trail users and cyclists riding much too fast when other, slower users are on the trail. We all need to be respectful of other trail users. There was a long discussion about the effectiveness of having a low speed limit on the trail in Vienna. Trail speed limits are mostly unenforceable. The Trail has never had a speed limit, unlike some other regional trails that have a 15 mph speed limit. The safe speed depends on so many variables such as weather, congestion on the trail, the type of trail users, the location, etc. The one proposal in which there was some consensus was to warn bicyclists to go slow when the trail is congested. Like I said, using common courtesy and respect for other trail users is the best option. We suggested, and the Vienna BAC is planning, to create an on-street alternative for bicyclists through Vienna. An example is the Mt Vernon Trail in Alexandria which is mostly on-road for bicyclists. One bypass option would take cyclists along the Richard Black Trail adjacent to Northside Park to Glyndon St. The would follow Glyndon to the end to Valley St to another short connecting trail to return the W&OD Trail. The other option would be hillier, taking a short trail across from the Richard Black Trail to Center St and follow Center St to Cherry St to the W&OD Trail at the Community Center. There was also talk about creating separated bicycle and pedestrian sections of the trail. This is done in many European cities and I've seen it on bridges in Portland, Oregon. However, there may not be enough right of way to widen the trail enough for this option. Karl said that NVRPA plans to move the trail adjacent to the Community Center to pass through the existing parking lot, which is owned by NVRPA. The current trail location is on Town of Vienna Property and is one of the more narrow sections. This would also reduce a tight curve and should be a benefit trail users and eliminate the many people who now cross the trail to get to their cars in the existing parking lot. Karl said he would review the various options suggested at the meeting and would consider using some of the more experimental treatments in Vienna as a test of their effectiveness. The Fairfax County Bicycle Master Plan Bicycle Advisory Committee (BAC) met on Wednesday to discuss the latest draft of the plan. The plan consists of three parts, the Recommended Bicycle Network Quadrant Maps, the Proposed Comprehensive Plan Update, and a series of Policy Briefs to provide context and additional detail for the policy and programmatic recommendations included in the plan update. The BAC spent a considerable amount of time discussing the Comprehensive Plan Update which describes the benefits of the plan, the plan vision and goals, bicycle facility selection and design policy, programs that support making Fairfax more bike-friendly, and a section on plan implementation. The BAC comments are being compiled and a final draft of the plan will be prepared, with the goal of presenting the plan to the Planning Commission and Board of Supervisors by the end of the year. The draft plan will be available to the public in the near future. Photo caption: Some members of the bicycle advisory committee. From left: Charlie Strunk, Doug O'Neill, Anne Mader, Fionnuala Quinn, Bruce Wright, Dennis Frew, Bob Patten, Steve Still, Erik Backus, Randy Dittberner, and Peter Christensen. As most people have heard, in June a woman walking on the Four Mile Run Trail was struck by a passing bicyclist. The woman fell, hit her head, and later died. The story was reported in the the Post and on the WashCycle. The Post article generated 593 comments. The WashCycle article generated a large number of comments as well. Anyone who rides the W&OD Trail on a nice weekend is well aware of the problems of mixing walkers, joggers, parents with strollers, and bicyclists on our trails. From my experience the situation seems to be getting worse although folks at NVRPA, who manage the trail, say they have not seen an increase in reported incidents. Personally I see more and more fast cyclists who pass too close, pass when there's oncoming traffic, don't give an audible warning, and otherwise ride aggressively. While the incident on the Four Mile Run trail may not have been related to a fast cyclist passing someone too close, there is always a danger when a cyclist passes a pedestrian faster than is appropriate. In the latest issue of Spokes Magazine, an excellent, free local bike magazine available in local shops, there are two articles on using our local trails. I've included both articles in full. They are well worth the time to read. Another good article on the same subject, not included here, is by Tim Fricker, the Vienna Pedaler writing in the Vienna Patch entitled W&OD Behavior. As Chris Eatough writes below, a collision between a bicyclist and pedestrian that results in the death of the pedestrian is extremely rare. Compare that single incident to the daily traffic reports we hear about motor vehicle crashes, many that result in injury and death. We somehow seem to take those incidents in stride. In last month’s SPOKES I wrote about the amazing utility of the off-street trail network known as the Arlington Loop. Thousands of people enjoy these trails every day, both on bike and on foot, and they serve a significant transportation function within Arlington and connecting to neighboring D.C., Alexandria and Fairfax County. Unfortunately on the morning of Monday, June 11, a tragedy occurred on the Four Mile Run Trail, a por- tion of the Arlington Loop near Columbia Pike, when a cyclist and pedestrian collided. The cyclist was heading in the same direction as the pedestrian and rang his bell and called out “on your left” as he approached. The pedestrian, Ita Lapina, moved left as she turned around. They collided and Mrs. Lapina was knocked down, striking her head on the ground. Mrs. Lapina died in the hospital that eve- ning. The worst possible outcome from a miscommuni- cation and a horrible situation for everyone involved. This is great information for all of us! As you can see, the flyer equally addresses tips for cyclists AND pedestrians. Sharing and communication is a two-way street and all trail users need to be aware of their sur- rounds and avoid anything that endangers themselves or others. We also have a Spanish version of the same material. Chill out! These are multi-use trails, not bike race tracks. Keep a reasonable speed, slow down to pass pedestrians or other cyclists, and give them plenty of space. If you are looking for high speed training, choose the open road. Use your bell – a lot! I ring mine well before I pass, basically as soon as I am within audible distance. Then I keep on ringing as I approach. The multiple rings help communicate the rate of approach, and also the side of the trail that I am on. It’s a friendly sounding bell so I really don’t think anyone finds this obnoxious. Be completely in control at all times. That includes expecting the unexpected, riding at a reasonable speed, maintaining a safety buffer all around you and being alert. Keep it friendly. Everyone on the trail is your ally. These are people choosing human powered mobility! There is no place for road rage on the trails. I always give a little wave and say “thank you” right after passing a pedestrian or cyclist. The friendly interaction goes a long way. I urge everyone to keep the “Sharing the Way” tips forefront in their minds when they are on the go. Our trails are no place for EMTs and ambulances. There is a battle raging in Washington, which is characterized by a power struggle and partisan strife. WHILE THIS IS NOTHING NEW to Washington, this battle is not being waged on a particular hill nor does it involve any politicians. Regardless, it is just as contentious and its parties are just as divided. Unlike many other Washington turf battles, this one is actually over terra firma or more precisely—asphalt and cement. The Washington metropolitan area has hundreds of miles of mixed-use trails, which wind in and around the District and its many suburbs. These public trails cater to a diverse user base comprised of runners, walkers, rollerbladers, and cyclists of all abilities. The relatively narrow trails, usually eight to 10 feet wide, bring pedestrians and cyclists into conflict and some- times direct contact. Tripp leads the Coalition for the Capital Crescent Trail, an advisory and advocacy group comprised of volunteers representing runners, walkers, and cyclists. While the organization often lobbies for trail modi- fications, it is dependent on local, state, and federal governments to approve and fund its suggestions. The multi-jurisdictional nature of area trails, which cut through multiple counties and even states, makes it difficult to implement any improvements. The trails’ multi-jurisdictional nature also complicates bicycle crash reporting. Each government has a dif- ferent crash-reporting standard and the area governments do not always exchange crash data. Data collec- tion is further hampered by the fact that most bicycle crashes, not involving serious injury, go unreported. WABA first began collecting bicycle crash data six months ago and has yet to publish its findings. WABA’s system relies on cyclists to self-report crashes and focuses mainly on roadway incidents involving cyclists and motorists. Since the program just started this year, historical data is also not available for analysis. According to Billing, serious collisions are relatively rare; however, there are often close calls between cyclists and pedestrians especially during the trails’ busiest times. These near misses have led to a blame game and a rift between area cyclists and pedestrians. Pedestrians and cyclists each hold differing views on who is responsible for unsafe trail conditions. Pedestrians argue that the near collisions stem from cyclists operating at unreasonable, unsafe speeds. Cyclists contend that they operate at a safe speed, and that it is distracted runners and walkers, who are creating an unsafe envi- ronment. While both parties are deeply divided, they do agree that area trails’ aging infrastructure is inadequate and needs to be modernized. Speeding Tripp said he frequently receives complaints from angry walkers complaining about bikers going too fast. Dolores Cole, a regular walker on Mount Vernon Trail, blames cyclists for creating a dangerous environment by operating at unsafe speeds and executing dangerous passes with little or no warning. “I think the bikers treat the trails as their domain, and most of the time they don’t notify walkers,” Cole said. The 67-year-old grandmother said that she is often forced off the trail’s pavement by speeding cyclists. Billing acknowledged some of the more experienced cyclists, especially those on teams, speed on the trails. Based on WABA data, Billing estimates that 10 per- cent of crashes are completely outside of cyclist’s con- trol and even experienced cyclists are susceptible to this type of crashes, which stem from errors by other trail users or equipment failure. “If you are doing 20 mph, it is going to be harder to stop yourself especially if there are other people behind you,” he said. Late this year, local authorities stepped up speed enforcement on local trails. Last month, Arlington County Police deployed an officer with a speed gun on the Custis Trail, who wrote several tickets to speed- ing cyclists. According to Billing, the Washington Metropolitan Police Department has also stepped up its bicycle speed enforcement efforts as well. Lori Zibel, 20, of Washington is an avid runner, who also recently had a near miss with a passing cyclist. Zibel, a sophomore at George Washington University, uses the area’s mixed-use trails as part of her mara- thon-training regime. “I was running the Arlington Memorial Bridge into Virginia and I was almost hit by a passing cyclist,” Zibel said. Zibel admitted that she was partly to blame for the near-collision. Like many other runners, she was running with headphones and was unable to hear the cyclist’s audible warning. “I am dependent on music to get me through a work- out,” Zibel said. “I try to put the volume on low...but often times I find myself turning it up as my workout intensifies.” Zibel is part of a growing number of trail users who are distracted by their personal music devices. Peter McSwain, a recreational cyclist, believes that this distraction is the single worst safety issue affecting area trails. James Bellora, an experienced cyclist who rides com- petitively for Squadra Coppi, shared McSwain’s sentiments. He said that he hit a distracted jogger a couple of years ago on the Mount Vernon Trail. Headphone usage is not limited to pedestrians. An increasing number of cyclists are also using the devic- es. Bellora said that his club recently banned head- phones and personal music devices on all of its rides. WABA has always advocated against earbud usage and other types of distracted riding. “When we are doing trail site outreach, we let people know that biking with headphones is a big issue and it is unsafe to use them,” Billing said. “ We have to use all of our senses to be safe out and it is unsafe to have something that prevents you from hearing other cyclists, cars, or pedestrians. The Coalition for the Capital Crescent Trail recently published an open letter on its website, which encour- aged all of its trail users to take out their earbuds and stay alert. Many area trails were not designed for the level of use that they receive especially during peak hours. This congestion creates conflict between trails’ diverse user groups, who are all vying for a limited amount of space. The Capital Crescent and Mount Vernon Trails are both heavily trafficked and frequently congested. The Capital Crescent Trail is like a bicycle highway during weekday commuting hours, while the Mount Vernon Trail is crowded with families on weekends. Congestion is not the only infrastructure problem plaguing area trails. Some of the area’s oldest trails are in desperate need of resurfacing and widening. “There are definitely trails that need work and need upgrading,” Billing said. One such trail is the Rock Creek Park multi-use trail. Portions of the trail are unpaved and suffer from sig- nificant erosion. The trail’s paved portions need to be replaced, and in some instances rerouted. Current National Park Service (NPS) plans call for the trail to be resurfaced and widened to a minimum width of 6 feet and a maximum width of 10 feet. Billing said that this upgrade has been in the works for 10 years and that construction will most likely move forward in 2012. Many trail users have advocated for similar improve- ments on other trails, which they believe will reduce conflict and promote safety. Billing said trail users must understand that trail renovation projects do not happen overnight and are contingent on funding and environmental assessments. NPS officials, who administer the Mount Vernon Trail and other area trails, said that they are continuously looking to improve safety on area trails through incre- mental changes. In the past few years, they have focused their efforts on reengineering and rebuilding dangerous intersec- tions and interchanges. NPS officials said that their crews and contractors regularly perform preventative maintenance and trail rehabilitation. Many officials and users agreed that the onus is on trail users to create and maintain a safe trail environment. “Bicyclists and other trail users have a responsibility to keep each other safe,” Billing said. While it is impossible to prevent every bicycle crash, local officials have several suggestions for cyclists and runners, which will help to cultivate a safe trail environment. Yesterday we attended the SAIC Transportation Fair. As you can see from the photo on the right, it was held outdoors in one of the massive parking lots next to the building located on Greensboro Dr in Tysons. It's always impressive how much free parking space is used in Tysons, where land is very valuable. And people think that bicyclists don't pay for facilities. We all pay for free parking. We talked to several people who live very close to Tysons. They all said they would ride to work if they could do so safely. I had a copy of the latest version of the Fairfax County Bicycle Route map that is being delivered to the county this week, showing people the many bike-friendly routes leading to Tysons. The worst part of the ride for most people is along Gosnell Road and Westpark Road. During rush hour the streets are packed with commuters and even the most experienced cyclists are challenged by the conditions. We need to make these critical connecting routes more bike-friendly. We rode to the event, using the same route we used to the Wolf Trap concert, instead turning right on Gelder Ln at Trap Rd, left on Bois Ave, left on Montmorency Dr to the end where there's a trail into Tysons behind the Sheraton. We crossed Route 7 and took a right on the paved trail to Spring Hill Rd at the site of the new Metro station. There's a short climb after turning right on Greensboro Dr to the SAIC parking lot. It took about 35 minutes, probably less time than it would take to drive, park, and walk to the building during heavy rush hour. It was a very pleasant ride for most of the trip. On the return trip we wanted to check out the Gallows Road bike lanes again as they were part of a discussion of bike lane widths at the Bicycle Master Plan advisory committee meeting on Wed. We rode to Tysons Corner Center mall then to the ring road past the Towers Crescent building to a left on the bridge over Route 7 where we took the photo above. There's a new, much needed trail that extends from the new bridge over the 495 Express Lanes/Beltway to this location where it abruptly ends. Someone needs to complete this connection to the service road you seen in the distance. We're trying to find out if that's in the works. If you're riding on the Gallows Road bike lanes this week beware that there is construction on the northbound lane just north of Idylwood Rd where the bike lane is closed and cyclists must merge with traffic in the center lane. The bike lanes are a vast improvement over previous conditions. When traffic is congested cyclists can easily ride to head of the line at traffic lights. The lanes are about 4 feet wide with a 2 foot gutter pan. Even so we'd like them to be 5 feet wide but they work pretty well as is. Finally, we eventually made our way back to the W&OD Trail where we took the photo of a motorist who had turned right onto the W&OD Trail thinking it was either a road or an entrance to the adjacent Whole Foods store. People do some crazy things out there so beware. That's the second car we've seen on the W&OD Trail in that area, but we would definitely not want bollards placed at the entrances which are a hazard to cyclists, especially at night. Maybe better signage is needed. We went to see Wilco at Wolf Trap on Tuesday. We live in Reston near South Lakes Village Center and it's only 6 miles to Wolf Trap. Here's a map of the route, which uses the W&OD Trial, Clarks Crossing Road, a short stretch of Beulah Road where new Bicycles May Use Full Lane signs were recently installed, Trap Road, the trail along Trap Road in front of the Barns at Wolf Trap, and the great new bridge over the Toll Road to the park. In searching our blog I see that the last time I rode to Wolf Trap was to see Wilco in 2009. Unfortunately the same crummy rack that I complained about then is still in place. It really is time for Wolf Trap to provide some decent bike parking for patrons, especially now that there's a great bridge that allows cyclists to easily ride to events. We'll send them a nice note requesting a few U racks. for many years. Time for an upgrade. Anyway, as I was leaving I happened across Robert from the bike shop where be both work, and two other cyclists who were headed to the W&OD Trail. We decided to form a bike train and ride to the trail. I can tell you how much nicer it is to leave the Wolf Trap gates, walk a few steps to our bikes, and ride past all the frustrated motorists waiting to exit the park. It took about 35 minutes to get home, probably less time than it would take to walk to our car, wait to exit, and drive home. An added plus was following a fox on the W&OD Trail for about 50 yards. It was a very pleasant ride home. You should try it next time you visit Wolf Trap. At a Public Hearing last week Herndon Town Council members were presented the recommended elements to be incorporated into the Fairfax County Bicycle Master Plan. The Council was asked not to build a bicycle network but just to endorse a plan that will go forward to the County. The Herndon Pedestrian and Bicycle Advisory Committee (PBAC) presented a well thought-out plan that outlined some recommended bicycle infrastructure that would connect the historic downtown with the future Metro station, the W&OD Trail and surrounding communities like Reston, Sterling and Oak Hill. The PBAC plan includes on-road paint treatments like Sharrows (aka shared lane markings) and bike lanes. They also recommend a cycletrack, or separated bikeway, along Herndon Parkway to link an important north-south corridor (Van Buren St) with the Metro station. So based on the above you’d expect some discussion on how people use bicycles in the town, or perhaps how sharrows might impact safety. The discussion was in two parts: 1) discussion by the Town Council and 2) comments from the public. Do you see any common themes between what the Public thought was important compared to the Town Council? I really didn’t either. The Council voted to defer the vote until the August 14 meeting so the town engineers can review the plan. We cannot expect the Town Council to be experts in bicycle and pedestrian safety; however, the Council received conflicting and incorrect information at the Town Council meeting. It was stated by town staff that bicycles must move over when a car comes up behind them on a narrow road and may not ride in the middle of the lane, which is allowed by Virginia State Law. FABB hopes to meet with members of the PBAC, Herndon Police Department, and the County Bicycle Coordinator to clear up any confusion on bicycle infrastructure and bicycle laws. 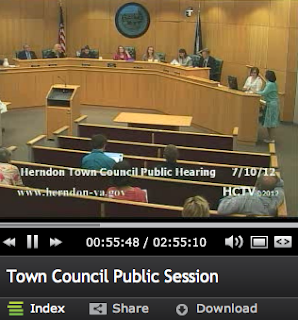 I hope the Town Council gets the information they need to realize the benefits of a more bicycle-friendly Herndon. See the video replay of the Council meeting. Click on Video from the July 10 meeting. What is the Fairfax County Bicycle Transportation Plan, and how does it impact the Town of Herndon? The Fairfax County Bicycle Transportation Plan is a comprehensive planning effort, currently under way, to make the county’s roads bicycle-friendly. The plan will consist of a map identifying locations of future bicycle facilities as well as a policy document that outlines implementation of the plan. After getting community input at a series of public meetings, Fairfax County has developed a recommendation for a bicycle facility network that includes facilities in the Town of Herndon. The county plan is expected to be considered for adoption by the Board of Supervisors in winter 2012-13. Does the Town of Herndon have an opportunity to weigh in on the plan and make its own recommendations? Yes. A resolution currently before the Herndon Town Council outlines specific bicycle facilities, located within the town that, if adopted by the council, will be formally endorsed for inclusion in the county plan. The Town Council will hear public comment at its public hearing on August 14, 2012, and is expected to vote on the resolution at that meeting. Who crafted the town’s recommendations, as outlined in the resolution the council will be considering on August 14? Upon receipt of the county draft plan, town staff worked with the town’s Pedestrian and Bicycle Advisory Committee (PBAC), a committee formed by the Town Council to study and advise on issues related to bicycle and pedestrian access and safety throughout the town. PBAC worked to refine the county plan to specifically address issues within the Town of Herndon. The PBAC recommendation was then presented to, and subsequently recommended by the town’s Planning Commission for Town Council approval. What types of recommended bicycle facilities are included in the town’s resolution? I see references to “sharrows” in the PBAC recommendations. What is a sharrow? 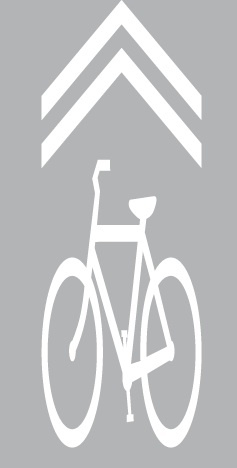 A sharrow, or shared lane marking, which is identified with a distinctive bicycle marking: 1) identifies where bicyclists should ride in a lane where on-street parking is present to reduce the chance of being impacted by the open door of a parked vehicle; 2) identifies where bicyclists should ride in lanes that are too narrow for a motor vehicle and bicycle to travel side by side in the same lane; 3) alerts road users of where bicyclists are likely to ride within the roadway; 4) encourages safe passing of bicyclists by motorists; and 5) reduces the incidence of wrong-way bicycling. If the Town Council does not adopt the resolution making specific recommendations to the county plan, what happens then? Fairfax County may include facilities proposed in the Town of Herndon in its comprehensive planning effort, but the plan will not be considered as part of the town’s comprehensive plan. Comprehensive plans are long-range planning documents that set policy and do not usually indicate short-term construction projects. Inclusion in the county’s plan does not place any obligation on the town to finance or construct bicycle facilities, nor does it give permission to Fairfax County to build facilities in the town. If the Town Council does adopt the resolution, what happens then? Should the Town Council, after hearing public comment, adopt the resolution on August 14, the town’s recommendations will be formally submitted to Fairfax County for inclusion in their plan. This action will not, however, automatically revise the town’s 2030 Comprehensive Plan. The town may opt to include its bicycle recommendations in future updates of its comprehensive plan; this would not happen without advertised public hearings before both the Planning Commission and the Town Council, so that public input may be provided. How much will it cost to implement the county’s plan? The costs to implement the county’s plan are unknown at this time. Should the Town Council adopt the resolution endorsing specific recommendations to the plan, the cost of implementation of bicycle facilities in the town would then be considered when bicycle facilities are added to the town’s 2030 Comprehensive Plan and Capital Improvements Plan. It is important to note that inclusion of the PBAC recommendations in the county’s plan will likely provide additional leverage should the town then apply for grants to fund the construction of bicycle facilities. Visit the town’s Web site at www.herndon-va.gov; see “What’s New” to link to a page with information on the Fairfax County Bicycle Transportation Plan and the town’s proposed recommendations. In the Fairfax Times article New state road signs spark confusion for cyclists, motorists: ‘Bikes May Use Full Lane’ intended to alert motorists that cyclists can use center lane on narrow roads, a motorist is quoted as saying the new signs are illegal. The new Bicycles May Use Full Lane signs are used "where travel lanes are too narrow for bicyclists and motor vehicles to operate side by side" according to the official guidelines for their use. The guidelines go on to state "The Bicycles May Use Full Lane sign may be used in locations where it is important to inform road users that bicyclists might occupy the travel lane." In the article Ronald Corso, who says he's a cyclist, complains about "bikers taking up the full lane and going a fifth of the speed limit and backing up traffic." He goes on to state that he thinks the signs are illegal: "In addition, the signs appear to be in conflict with [Va. Code § 46.2-905] which states: ‘Bicyclists operating a bicycle on a roadway at less than the normal speed of traffic at the time and place under conditions then existing shall ride as close as safely practicable to the right curb or edge of roadway.’"
What Mr. Corso neglects to quote is the end of that sentence in the code, "except under any of the following circumstances:" One of those circumstances is "substandard width lanes that make it unsafe to continue along the right curb or edge." Fortunately Randy Dittberner of VDOT knows the code and he did a good job of explaining why the signs are needed. The signs are for both cyclists and motorists. The cyclist pictured in the article (above) is demonstrating what not to do in a narrow lane, ride in the gutter. This is very dangerous. There is not enough operating room and one small mistake by a cyclist in this position could lead to a crash, potentially in the path of a following motor vehicle. The cyclist is much safer riding away from the curb. If the lane is too narrow to share with a motorist, taking the lane and forcing motorists to pass safely is the best option. Regarding delay of traffic; bicycles on the road are part of traffic and during rush hour often travel about the speed of other traffic. Even if traffic is traveling at the posted speed, which is 35mph on Beulah Rd, bicyclists are traveling only slightly slower than other traffic. Delays for following motorists, especially on the short 1/4 mile stretch between Clarks Crossing Rd and Trap Rd where most cyclists ride on Buelah, are minimal. We wrote about the signs not long ago, along with several articles about shared lane markings. Obviously more needs to be done by VDOT and the county to educate motorists and cyclists about the purpose of the new signs and markings and about the laws in Virginia as they apply to bicyclists. We just learned that the Herndon Town Council is holding a public hearing tonight on the Fairfax County Bicycle Master Plan recommendations for the Town. The meeting begins at 7:00 p.m. in the Herndon Council Chambers Building located at 765 Lynn Street, Herndon. Cyclists are encouraged to attend the meeting and speak out for on-road bike routes in the Town. Herndon has great potential for being a very bicycle-friendly community but there are currently no designated on-road bike facilities. Bike lanes on Dranesville Road end just north of the Town boundary. Resolution - Summary of the proposed action: consideration of a resolution recommending to the Town Council that the recommendations of the Planning Commission regarding proposed bicycle facilities within the town be endorsed and forwarded to Fairfax County for inclusion into the Fairfax County Bicycle Transportation Plan. The proposed bike facilities for Herndon have been identified by the town’s Pedestrian and Bicycle Advisory Committee and sent to the Planning Commission for their review and recommendation to the Town Council. The general goal of Fairfax County’s Bicycle Transportation Plan is to identify specific improvements that are needed to accommodate and encourage bicycling within and between activity and population centers throughout Fairfax County, adjacent jurisdictions as well as to/from rail stations along the Dulles Metrorail Silver Line. Thursday, July 19, 2012 in the Middle School Cafeteria of Hayfield Secondary School at 7630 Telegraph Road, Alexandria, VA. Both meetings will be in an open house format from 6:30 p.m. to 9:30 p.m., with a brief presentation at 7:00 p.m. and attendees are invited to join in two workshop discussions following the presentation. This study will determine the most effective way to serve the County’s long term mobility needs and accommodate planned growth by establishing a network of high quality transit corridors. The purpose of the public meeting is to discuss the study purpose, scope and schedule and help refine proposed study goals and objectives, as well as to identify possible modifications to the Comprehensive Plan designation of Enhanced Public Transportation Corridors. A project website has also been developed to keep residents up to date on project related news and provide feedback in the form of an online survey, which will remain open for comment until August 10, 2012 at http://www.fairfaxcounty.gov/fcdot/2050transitstudy. Please consider taking the Transit Survey. The final stages of the Fairfax County Bicycle Master Plan process are underway. At the final two countywide meetings cyclists were asked to rank a list of 18 Early Initiatives. The Initiatives were based on feedback from public meetings held over the past year. The top ranked initiatives were: Create BikeFairfax along the lines of BikeArlington, Strengthen the existing Fairfax DOT Bicycle Program, Develop a Trail Maintenance Program, Create a permanent Bicycle Advisory Committee, and Focus on the VDOT Resurfacing Program to create new bike facilities. The responses will help the Plan team as they develop recommendations for how the county should invest funding, what strategies should be used to build the route network, and which subject areas should receive the highest priorities. The draft bicycle route network is now being revised. The bike plan Advisory Committee will meet again in mid July to review the latest draft of the plan and the route network. The goal is to complete the plan by the end of July. Public hearings at the Planning Commission and Board of Supervisors will likely be held in late Fall, early Winter. Shared Lane markings, usually called "sharrows", are starting to appear on roads in Fairfax County, including Courthouse Road near Tysons and Westmoreland Street in McLean. FABB has been advocating for these signs since they were initially developed. The signs consist of two chevrons pointing forward with a bicycle symbol below. Sharrows are used to indicate to cyclists where they should safely ride in the road. The markings are placed away from parked cars so cyclists will avoid the dreaded "door zone." Sharrows also let motorists know to expect bicyclists in the road. Some motorists and even some cyclists are not aware that bicyclists have the same rights and responsibilities to use the road as do motorists. If the road is less than 14 feet wide it is considered too narrow for a bicyclist and a motorist to travel side by side. On those roads cyclists should ride in a way that motorists are not tempted to share the lane with them and pass dangerously close. In these cases, sharrows are placed closer to the middle of the lane. Bicycles May Use Full Lane signs send the same message as the sharrow, that bicyclists belong on the road, and on narrow roads cyclists have the right to the entire lane. These signs were recently installed on a section of Beulah Road that is along a route between the W&OD Trail and Tysons Corner. The signs also appear on a short stretch of Idylwood Road on a route between the W&OD Trail and the Pimmit Hills/McLean area. We hope you were able to attend Tour de Fat. The event was a bike extravaganza sponsored by New Belgium Brewing, makers of Fat Tire Ale. It was held on June 16 at The Yards Park on the banks of the Anacostia River two blocks from Navy Yard Metro station and Nationals Park. The event was a full day of fun bike activities starting with a bike parade that included many costumed riders. FABB volunteers staffed the ID/Wristband station and we raised $500 to support our advocacy work. Thanks to all the volunteers who helped. I think I can speak for them and say that we all had a blast. Activities throughout the park included the tire toss, Le Tigre performances, the bike pit, life-size Jenga, and performances by acts including Mucca Pazza, Ian Cooke, and Yo-Yo People. FABB is working with Fairfax County and George Mason University to organize a Fairfax Bike Summit this Fall. The summit will be an opportunity for people to get together to discuss how to make Fairfax more bicycle-friendly. A major goal of the summit will be to build support for the county Bicycle Master Plan. Stay tuned for details. We've developed an online form for reporting bike crashes or other incidents. While any bike crash should be reported to the police, many incidents are never reported. In the past, Fairfax County Police collected information using their Aggressive Driver form. Due to budget cuts, that form is no longer available. Cyclists can use the FABB form to report harassment from motorists, incidents on trails, or anything else that you think needs to be reported. A summary of reported incidents will be published periodically. FABB volunteers participated in the National Bicycle Documentation Project on May 24 & 26. A goal of the project is to provide consistent bike counts for designated locations to record usage over time. We believe strongly that "if you don't count bikes, bikes don't count." VDOT has conducted some bike counts in the past, but only a small number of locations are in Fairfax (the W&OD Trail in Reston and Vienna). We began the project in July of last year. In May we counted cyclists at W&OD Trail/Gallows Rd, W&OD Trail/Route123 (Maple Ave), W&OD Trail/Fairfax Co Pkwy, Chain Bridge Road/Westmoreland St, and George Mason Blvd/University Dr. Thanks to the FABB volunteers who participated. 12,700 cyclists registered for Metro DC Bike to Work Day. FABB members attended most of the 10 Fairfax pit stops, signing up cyclists for our newsletter. Welcome to those of you who signed up. Every year more cyclists participate in this event, a testament to the popularity of bicycling and the need for better bike facilities in the county. FABB organized a bike locker giveaway at the Reston Bike to Work Day Pit Stop for the second year. Cyclists could enter to win one of two county bike lockers at the Reston Transit Center, Sunset Hills Park & Ride Lot, Herndon-Monroe Park & Ride Lot, or South Reston Park & Ride Lot. FABB sponsored a social ride through the City of Fairfax on June 30. Ten riders toured on- and off-road routes throughout the city, including part of the Mason to Metro route to the Vienna Metro station. Along the way we discussed a proposed new tunnel connection to the Cross County Trail under Pickett Lane. We rode one of the alternate Mason to Metro routes on the return trip, passing through the Mosby Woods neighborhood. Several trails were blocked by fallen tree limbs as a result of the strong storm that passed through the area the night before. Bike people power was required to clear the way. Future rides include tours of McLean and Reston. Once dates are determined they will be posted on the FABB Events calendar. We plan to post the cue sheets for our rides in the near future. We had a very successful FABB Happy Hour on June 28 at Coyote Grill in Fairfax City. It was a great opportunity to mingle with fellow cyclists over good food and drinks. Over 30 cyclists attended. Thanks to Ann and Douglas who organized the event and thanks also to the Bike Arlington forum crew who rode in for the occasion. Bike sharing on horizon for Fairfax is the title of an article in the The Examiner about the possibility of bike sharing in Reston or Tysons. As we reported earlier, Fairfax applied for but didn't receive TIGER II funds for bike sharing. See our article in Reston Patch about the feasibility of bike sharing in Reston. "I am very interested in seeing it happen," said Fairfax County Supervisor Cathy Hudgins, a Democrat whose district includes Reston. "I think it's a possibility in the near future." Officials say plans for bike sharing are still just being discussed and they aren't sure if a Reston pilot would be plugged into the Capital Bikeshare brand already popular in the District and Arlington. But they said they hope some form of bike system will be in place in time for the opening of Metro's Silver Line at Reston, slated for early 2014. "The county definitely does want bike sharing," said county spokeswoman Beth Francis. "We don't have funding right now, but it's definitely in the plans." Montgomery and Prince George's counties and Alexandria are already slated to join the Capital Bikeshare program. Hudgins toured Arlington's bike facilities last summer. She said she wants to talk to Reston businesses and community members to figure out details such as where to put stations. She said the county, like Arlington and the District, would search for a private partner for the bike system.